Cosmetic dentistry is generally used to refer to any dental work that improves the appearance (though not necessarily the functionality) of teeth, gums and/or bite. It primarily focuses on improvement in dental aesthetics in color, position, shape, size, alignment and overall smile appearance. Many dentists refer to themselves as "cosmetic dentists" regardless of their specific education, specialty, training, and experience in this field. This has been considered unethical with a predominant objective of marketing to patients. The American Dental Association does not recognize cosmetic dentistry as a formal specialty area of dentistry. However, there are still dentists that promote themselves as cosmetic dentists. Cosmetic dentistry includes endodontics and also periodontics. Whitening, or "tooth bleaching", is the most common cosmetic dental procedure. The doctor will first evaluate your teeth and smile to determine whether whitening is right for you. In some cases, a different cosmetic procedure may better meet your expectations, but whitening is a safe, fast and easy process that is effective for almost everyone. While many whitening options are now available, including over the counter products, dentist-supervised treatments remain the recommended procedures for lightening discolored teeth. Laser whitening is a teeth whitening technique in which gums are covered with rubber and a bleaching chemical is applied on the teeth. A beam of argon laser, which is intended to accelerate the process of bleaching, is then projected upon the teeth. This laser activates the bleaching chemical and lightens the teeth color. Laser whitening is said to be six times more effective in teeth whitening compared to other procedures. Tooth reshaping removes parts of the enamel to improve the appearance of the tooth. It may be used to correct a small chip, or to alter the length, shape or position of teeth, as well as when there is tooth size discrepancy; it can be used to correct crooked or excessively long teeth. The removed enamel is irreplaceable, and may sometimes expose dentin. It is also known as enameloplasty, odontoplasty, contouring, recontouring, slenderizing, stripping. This procedure offers fast results and can even be a substitute for braces under certain circumstances. Bonding is a process in which an enamel-like dental composite material is applied to a tooth's surface, sculpted into shape, hardened and then polished. An example of a bonding substance are inlays and onlays, which are used to repair decayed & cracked teeth. These are helped at those parts of teeth when a filling is too small to correct the decayed teeth and a crown would be excessive. Dental bridges are used to replace one or more missing teeth. Teeth on both sides of the space left by the missing teeth are prepared. A bridge is made up of abutments, the teeth that are prepped, and the missing, false teeth, which are called pontics. This procedure is used to replace one or more missing teeth and is cemented in. Bridges can consist of more than three teeth in total and the viability of any bridge is usually determined by applying Ante's Law and assessing where in the mouth the teeth are. Most bridges are fixed, they can not be removed. Fixed bridges cannot be taken out in the same way that partial dentures can. In areas of the mouth that are under less stress, such as the front teeth, a cantilever bridge may be used. Cantilever bridges or Maryland Bridges are used to replace anterior or front missing teeth, are minimally invasive but do have a reputation for failure. Bridges require commitment to serious oral hygiene and carry risk. The average life of bridges is similar to that of crowns which is nearly ten years. Veneers are ultra-thin, custom-made porcelain laminates that are bonded directly to the teeth. They are an option for closing gaps, enhance the shape, or change the color of teeth that do not respond well to whitening procedures. In the majority of the cases, some level of tooth reduction is necessary for optimal results. 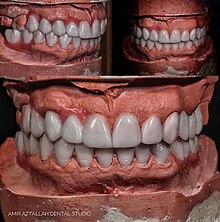 To achieve a pleasing smile, dentists fabricate diagnostic mock-ups, which act as a tooth preparation guide before the fabrication of veneers, it allows the dentist to visualize the changes needed to be done on the patient’s teeth with respect to size, shape and proportion, its relation with gingival-contour, lip contour and smile line. Mock ups can be a great aid in fabricating preevaluation temporaries, which can give a preliminary evaluation to the esthetics, phonetics and teeth occlusion, in addition, it gives an opportunity to the clinicians to check if they need to do any corrections. Dental implants are prosthetic replacements for missing teeth. According to ICOI (International Congress of Oral Implantologists) there are commonly three parts to what it is described as an implant: the implant device which is predominantly made of titanium (which is inserted into the bone), the abutment, and a dental crown or a denture which are connected to the implant through the abutment. A gum lift is a cosmetic dental procedure that raises and sculpts the gum line. The procedure involves reshaping the tissue and/or underlying bones to create the appearance of longer or more symmetrical teeth. Invisalign treatment is being used as an alternative to traditional metal braces. Invisalign helps in treating spacing, crowding, and overlapping teeth to create the smile patients desire. This system has treated hundreds of thousands of patients and has been around for over a decade. Clear aligners are comfortable, invisible and easy to clean. Bite reclamation is for patients who have had years of excessive wear to their teeth due to grinding or acid reflux can alter their vertical dimension. This gives them a closed or shorter look to their face and smile. By opening up their bite, a qualified professional can reclaim their vertical dimension. In the past, dental fillings and other tooth restorations were made of gold, amalgam and other metals—some of which were veneered with porcelain. Now, dental work can be made entirely of porcelain or composite materials that more closely mimic the appearance of natural tooth structure. These tooth-colored materials are bonded to the underlying tooth structure with resin adhesives. Unlike silver fillings (amalgams) they are entirely free of mercury. Cosmetic dentistry has evolved to cover many new procedures and new dental materials are constantly introduced. In USA, formally trained specialists recognized by the American Dental Association undergo a minimum of 2–3 years full-time rigorous education program after dental school graduation. These specialties also lead to board certification approved by the American Dental Association. Non-specialists with supplemental education related to specific interests. The certifications by these groups will not lead to approval by the American Dental Association. The American Academy of Cosmetic Dentistry (AACD) is the largest international dental organization in the world, composed of general dentists, specialists, and lab technicians focused on the art and science of cosmetic dentistry. Founded in 1984, the AACD has over 7,000 members in the United States and more than 70 countries around the globe. Members of the Academy include dentists, dental laboratory technicians, educators, researchers, students, hygienists, corporations and dental auxiliaries. AACD members seek out continuing education through lectures, workshops, and publications in order to keep up-to-date with all of the advancements in cosmetic dental techniques and technology. In 1984, the AACD was formed and has filled the dire need for credentialing in cosmetic dentistry. The purpose of the American Board of Cosmetic Dentistry (ABCD) is the testing, analyzing, and evaluation of the services of dentists and laboratory technicians for the purpose of awarding AACD Accreditation in cosmetic dentistry. However, this certification is not approved or recognized by the American Dental Association. American Society For Dental Aesthetics: Conceived in 1976, the American Society for Dental Aesthetics was developed with a single purpose in mind: continuing dental education to teach dental health professionals the most advanced aesthetic and restorative techniques available. To become a member of the ASDA, a dentist must show a minimum of five years in dental practice, or postgraduate training of two years in an approved program; attendance to at least two ASDA sponsored continuing dental education seminars; nomination by a member accompanied by two letters of recommendation by Society members; presentation of five (5) cases illustrating the concepts of aesthetic dentistry. Newell Sill Jenkins (1840–1919) was an American dentist who practiced most of his life in Dresden, Germany. He developed the Jenkins porcelain enamel and improved, thus making a composition of the porcelain paste, porcelain inlays, dental crowns and bridges. He is thus the founder of aesthetic dentistry. ^ Schmidt, Christopher J; Tatum, Sherard A (August 2006). "Cosmetic dentistry". Current Opinion in Otolaryngology & Head and Neck Surgery. 14 (4): 254–259. doi:10.1097/01.moo.0000233596.68928.39. PMID 16832182. ^ Maihofer MG (February 2009). "Cosmetic dentistry is not a recognized specialty". J Mich Dent Assoc. 91 (2): 18. PMID 19288658. ^ "Specialty Definitions". American Dental Association. Retrieved 24 September 2015. ^ "Home - American College of Prosthodontists". prosthodontics.org. ^ "Tooth Whitening". Image Dental Clinic. ^ Sun G (2000). "The role of lasers in cosmetic dentistry". Dental Clinics of North America. 44 (4): 831–850. PMID 11048275. ^ "Teeth whitening facts". Advancewhitening. Retrieved 30 September 2018. ^ GRAUER D, HEYMANN GC, SWIFT EJ Jr (2012). "Clinical Management of Tooth Size Discrepancies". J Esthet Restor Dent. 24 (3): 155–159. doi:10.1111/j.1708-8240.2012.00520.x. PMID 22691075. ^ Bugaighis I, Karanth D, Borzabadi-Farahani A (2015). "Tooth size discrepancy in a Libyan population, a cross-sectional study in schoolchildren". J Clin Exp Dent. 7 (1): e100–105. doi:10.4317/jced.51819. PMC 4367995. PMID 25810819. ^ Khan, Sajjad A (17 February 2005). "Your Dental Health". The Day. Retrieved 24 September 2015. ^ "Cosmetic Dentistry". Gogosmile. Retrieved 21 August 2018. ^ "Bridges | American College of Prosthodontists". www.gotoapro.org. Retrieved 2017-05-17. ^ "Glossary of Dental Clinical and Administrative Terms". www.ada.org. Retrieved 2017-05-17. ^ Durey, K.A. (12 August 2011). "Resin bonded bridges: techniques for success". British Dental Journal. 211 (3): 113–118 (2011). doi:10.1038/sj.bdj.2011.619. PMID 21836574. ^ "CONSENTING TO COMPLEX DENTISTRY" (PDF). Office of the Public Advocate. January 2015. Retrieved 24 September 2015. ^ Burke FJ, Lucarotti PS (November 2012). "Ten year survival of bridges placed in the General Dental Services in England and Wales". Journal of Dentistry. 40 (11): 886–895. doi:10.1016/j.jdent.2012.07.002. PMID 22864053. ^ Thomas, Manuel S; David, K (2014-01-01). "Importance of anatomic mock-up for predictable esthetic smile design with ceramic veneers". Journal of Interdisciplinary Dentistry. 4 (1). ^ Barker, Olivia (18 January 2008). "Patients smile at getting long in the tooth". USA Today. Retrieved 24 September 2015. ^ "American Society for Dental Aesthetics". ^ "How to Become a Member - American Society for Dental Aesthetics - ASDA". asdatoday.com. ^ Dr. Newell Sill Jenkins, Revue d'histoire de l'art dentaire, p. 20.